Eh yes – just recompiled the thing. Looks like it works now. I thought I share, since this took some time to investigate. In the Quick Find View, I am including “First Name” and “Full Name” as search field. All works, until you try to search. If you have “John Smith” and you search “John” or “Smith” you get a hit, but when you search for “John S” you get nothing. This drove me CRAZY for a week, until, by exporting to Excel, I was able to see that the space that was inserted by the workflow was not a space at all but a nbsp, and that does not match “space”. There are many solutions to this problem, but they all have drawbacks. I should also note that this behaviour only appeared in CRM 2013/2015 and in the olden times it was possible to concatenate fields in workflows with spaces in between. I suspect that this is a side effect of a bug that was reported in this very forum (workflow was stripping all spaces). 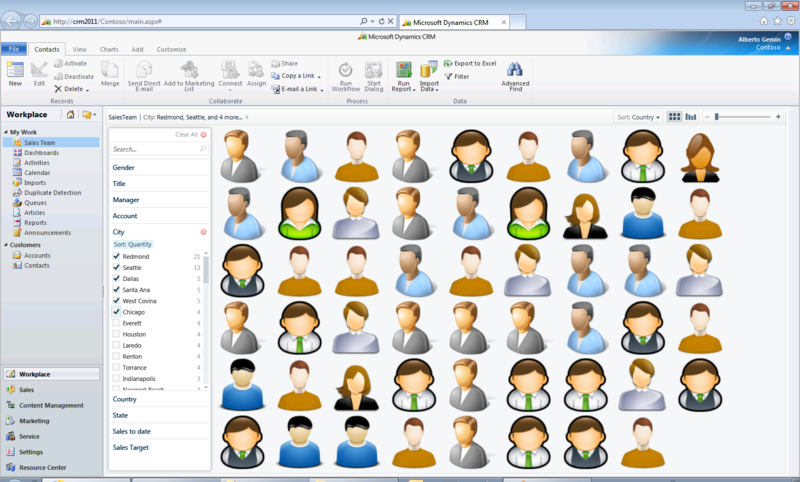 The CRM 2011 Views and Filters Toolkit Codeplex project is now up to its 7th release. The release contains one additional tool: DeleteSystemView, which allows to delete a System View with less hassle than with DeploySystemView. Thanks to Latho for pointing out how unpractical it is to use DeploySystemView for deletions. New: to simplify installation, this release provides a managed and unmanaged solution file in addition to the assemblies. You can find more information on how to use the toolkit by clicking on the Views Toolkit category of the blog. 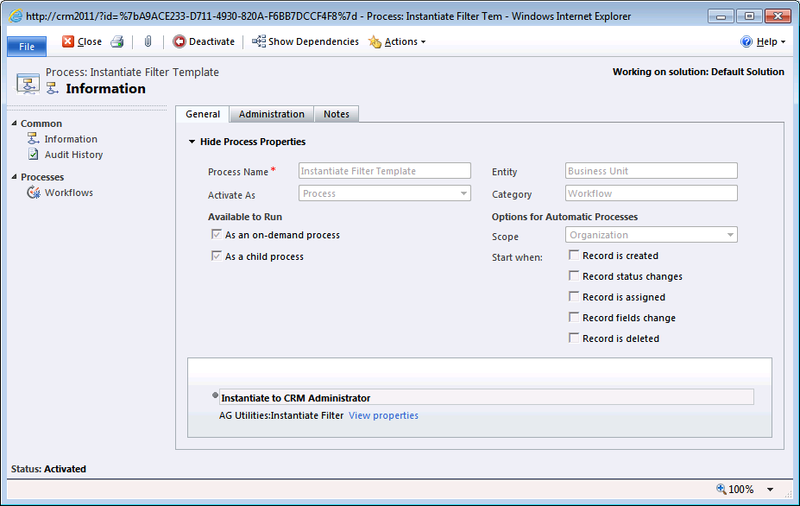 This article completes the series on Local Data Group management related to the CRM 2011 Views and Filters Toolkit. Here we’ll see how to deploy and instantiate filter templates for Outlook users. You can find more information about the toolkit by selecting the Views Toolkit Category of this blog. For a detailed discussion about Filters and Templates see this article. The examples shown below refer to Outlook Offline capabilities; they can be extended to the online case with minimal modifications. This note applies to this article as well. The default filter template for offline accounts is a query called My Accounts. This implies that by default, when a user is using the CRM Outlook client offline, they will see only accounts that they own. We want to change the default behaviour of CRM by creating a default filter template that allows offline users to see all accounts, not only the ones they own. To do so, we’ll take an already existing view (Active Accounts) and redeploy it as a filter template. This is done below in multiple steps for clarity, but it could be consolidated into just one workflow process. 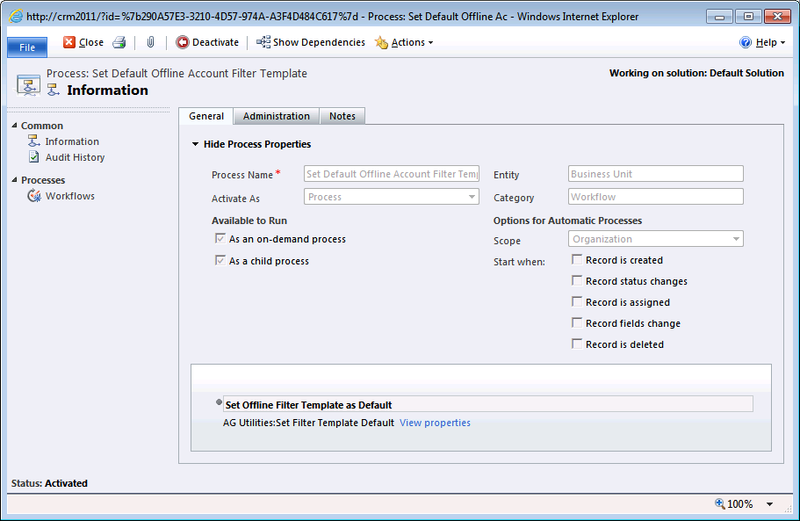 First let’s deploy an offline filter template called Outlook Accounts by creating a workflow called Deploy Offline Filter Template, as shown in the figure below. Note that all workflows in this example are based on Business Unit, but they could be based on any entity. When Existing: Error — This means that if the destination view already exists, the activity will fail. See the documentation in Codeplex for other possible values of this parameter. System View Name: Offline Accounts — This overrides the name of the view when deployed. If left blank, this would be the same name of the view in the View Definition parameter, which in this case is Active Accounts. System View Query Type: OfflineTemplate — This is the type of the view when deployed. Since I want to deploy a filter template for offline synchronization, this must be either OfflineTemplate or 8192. For a list of all view types see here. View Definition: View Definition(Retrieve “Active Accounts” System View) — This is the actual definition of the view, which is set to the output parameter of the RetrieveView activity. Now select the record relative to the Business Unit or organisation you want to affect, and run the Deploy Offline Filter Template Workflow. Now we have a new Filter Template that we can manually deploy to users (using the InstantiateFilter activity, see below for an example). However, since this template is not the default template for Accounts, when new users are created it will not be deployed by default. Let’s now see how we can change which Filter Template gets deployed automatically when new users are created. We want to change the default and have the newly created Offline Accounts template set as default, so that an Offline Accounts filter is deployed to new users instead than a My Accounts filter. Filter Template – This is the template we want to set as default. True: Set Default, False: Reset Default – This is quite self-explanatory I hope. Now select the record relative to the Business Unit or organisation you want to affect, and run the Set Default Offline Account Filter Template Workflow. Target User – The user we want to instantiate the filter to. Now select the record relative to the Business Unit or organisation you want to affect, and run the Instantiate Filter Template Workflow. One more thing: the process shown above is not the only way to instantiate filters. 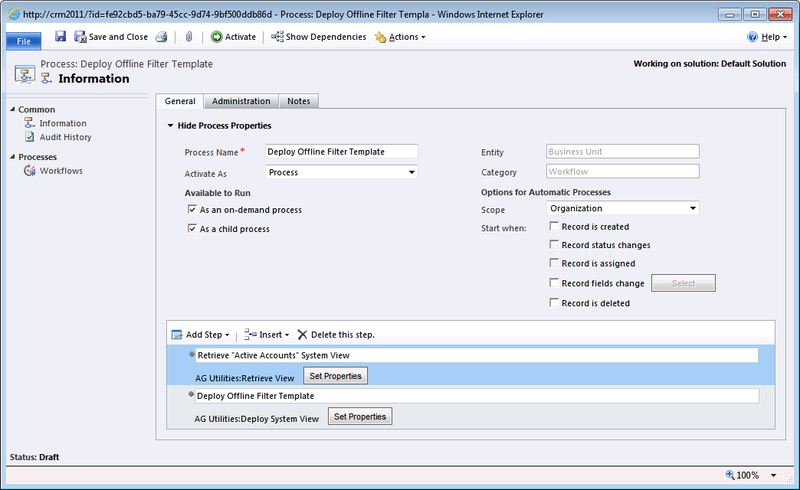 The CRM 2011 Views and Filters Toolkit contains another useful custom activity: ResetUserFilters will reset all filters for a particular user to their defaults. An example on how to do this can be found here: Reset User Filters with the Views and Filters Toolkit. We’ve come a long way tinkering with Local Data Groups, Filters and Templates. 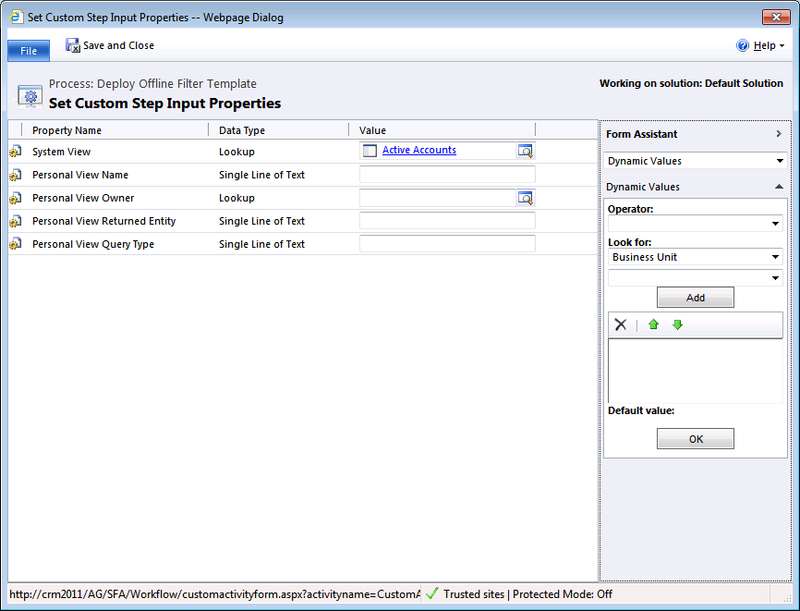 The process certainly helped me to understand in detail how this functionality works in CRM 2011. Hopefully you found a source of useful information somewhere buried in all these posts. Have you ever used Microsoft Pivot? Thinking of marrying its powerful visualisation capabilities to your CRM data and SharePoint images? Start here: pinpoint.microsoft.com. 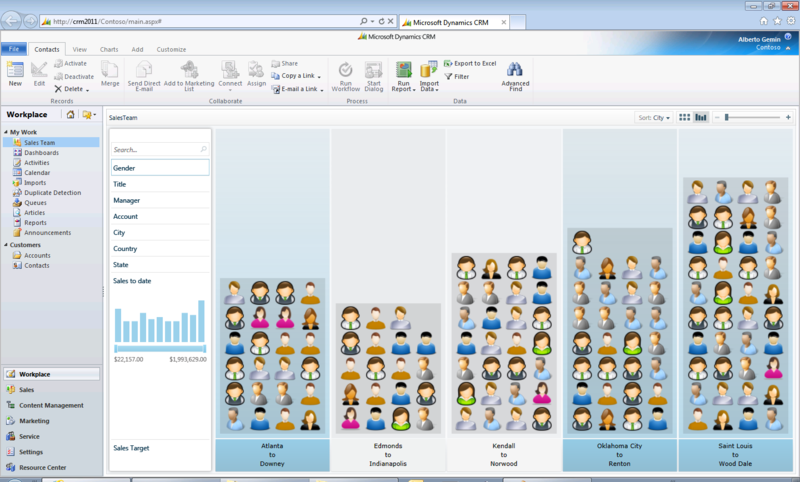 We built a complete solution to integrate Pivot into CRM 2011. The only thing you need to provide is the images. Pivot can be applied to any entity in CRM, be they users, opportunities, accounts, or custom entities. Scenarios include sales (visualize the performance of your sales team, analyze revenue by account, etc. ), marketing (browse through your product catalogue or brochures), and any other custom scenario, especially when your solution includes integration with media libraries (such as the out-of-the-box integration with SharePoint). The solution includes automatic batch processing for the generation of collections and DeepZoom tiles from any CRM entity (system or custom), configurable facets, visibility rules consistent with CRM’s privileges configuration, all this with a simple installation process, completely reversible and delivered as a managed CRM solution file. Let me know if you or one of your clients is interested. Purging the CRM database is a subject of endless discussion, but I want to share a very quick, a little dirty but very effective and simple way to considerably reduce the size of the database. At one of my clients, we realised that half of the database size was taken by email attachments and wanted to get rid of the older ones. What I’m about to describe is a non-supported solution, since it modifies the database directly, but it is many orders of magnitude cheaper, faster and simpler than other solutions. Furthermore, the modifications to the database are minimal, and won’t affect its relational integrity. where NNNN stands for the number of records that the script will process (the default is 1,000). This script can be run in small chunks (by selecting a low value for NNNN) so you can have an idea re how long it takes to run in production. What the script does is removing any attachment that is older than 1 year and substituting it with a small text file that, when opened, says “This attachment has been archived on November 2011”. The original file name is maintained, the script only adds a .txt extension to it. 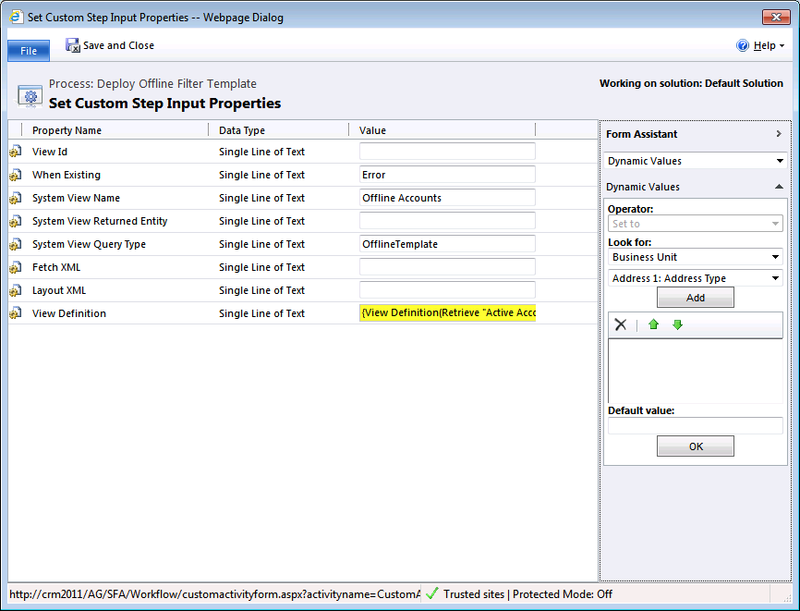 One more utility about getting number formats in CRM 2011. 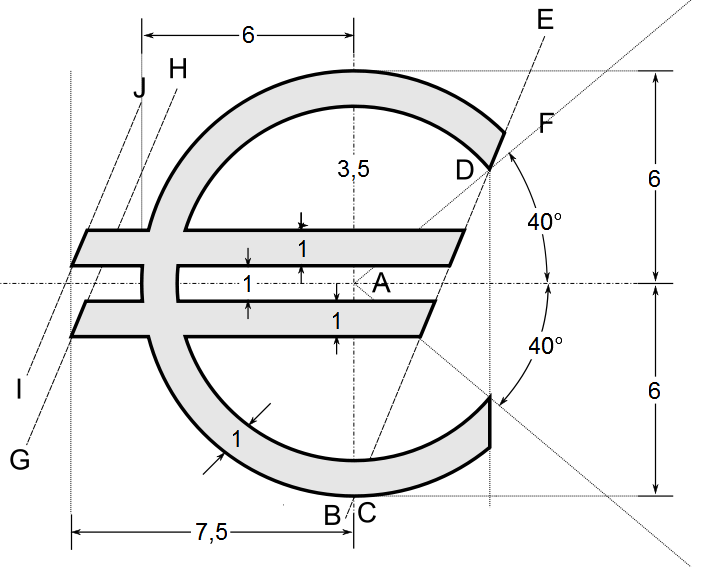 In this case the function below (in conjunction with the GetNumberFormatString function described in this post here), will return the format string for currency for the organization. Note that this is the format for the base currency of the organization. Other cases can be derived quite simply from this example.